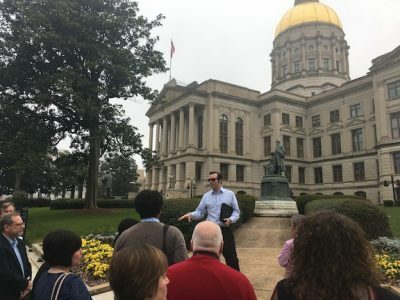 Morning fog had lifted from Georgia’s gold-domed state capitol yesterday by the time Cameron Bean addressed at its front steps the group he assembled on behalf of the Columbus Cultural Arts Alliance. Columbus State University Executive Director of Development Cameron Bean addresses local attendees of Arts Day before entering the state capitol. Inside, the capitol buzzed with people. Hectic enough with humans to snag a cup of coffee from a side-room breakfast serving a bunch of judges, the friendly swarm of groups including: Alzheimer Association reps in “We’re turning Georgia Purple” purple t-shirts, pharmacists in white lab coats, Girl Scouts, and some rodeo-star looking dudes tall and proud in white Stetsons. Code-word negotiations in a men’s room choked with poor ventilation to the point you think it might blust loose with the bacteria juice in a scene found in Columbus’ own Government Center but SURELY not under the Gold Dome. Gov. 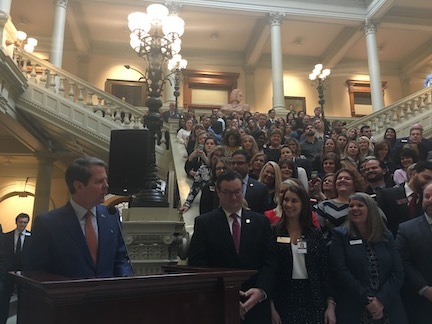 Brian Kemp spoke during the check-presentation ceremony for the $3.2 billion in state and local tax revenue generated in 2018 by the state’s tourism industry. He talked of a Georgia where “job rates are up, incarceration rates are down” and began most paragraphs with “Tourism …” The arts industry, which like tourism falls under the Dept. of Economic Development, was not specifically addressed. state’s tourism industry to show its tax-revenue total in Georgia last year. Next up, Lunch & Learn was on the 15th floor of the “Slappy” Floyd Building across Martin Luther King, Jr. Drive. It was hosted by the Dept. of Tourism, engineer of a record-breaking $63.1 billion economic impact last year. There, the arts delegation was again joined by Visit Columbus GA staff and executives to talk tourism efforts such as ExploreGeorgia.org and market development. The few-dozen local Arts Day attendees filled the seats lining the walls of the room reserved for the 2 p.m. meeting with Columbus-area legislators. Rep. Calvin Smyre entered the room and was introduce to each visitor. He spoke of his steadfast advocacy of the arts in Columbus during his 30-plus years in office (including help securing the RiverCenter) for its economic benefits but, more importantly, for “the way of life” arts engenders society. The Synovus executed then emphasized the need for those assembled in the room “to elevate” the arts in Columbus. The ever-gracious Smyre was soon joined by Sen. Ed Harbison. Rep. Debbie Buckner did not attend. 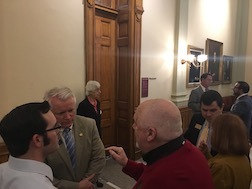 Sen. Randy Robertson did not attend, either, but did individually greet individuals earlier and gave group tours of the senate’s stunning chamber. Robertson’s wife Teresa Garcia Robertson, who recently left Outdoor Events to launch a marketing firm, talked at length with several local Arts Day attendees. with State Rep. Calvin Smyre and State Sen. Ed Harbison. At the meeting’s close, Bean offered up the only stated request: to restore the annual amount in grants money available through the Georgia Council for the Arts to its pre-Recession level of $4.5 million. The agency’s annual awards dropped as low as $500,000 but is now back up around $1 million. during Arts Day at the state capitol. Like his friend Symre, Springer Opera House Producing Artistic Director Paul Pierce is widely recognized as a venerable dean by his peers. Pierce was able to make direct appeals to continue a sales-tax exemption for theaters for tickets and construction (largely to help with Atlanta Theatre Alliance’s upgrade at the Woodruff Arts Complex in 2018). Pierce ran into a peer at Lunch & Learn in Lisa Love, Tourism Division Director in the Georgia Dept. of Revenue, hailed for her decades promoting Georgia music. On the bus ride back to Columbus, Stephanie Payne was asked her thoughts on Arts Day as both an arts-industry leader (as executive director of Columbus Youth Orchestra) and performing artist playing wind instruments for hip Irish folk group Wolf & Clover. She says that performing artists are removed from such “macrolevel” views of the arts unless they’re connected to an institution in some way. 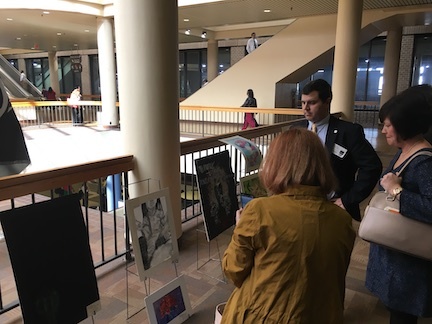 Muscogee County School District arts administrators look at the artworks of Rainey-McCullers School students on display at the state’s “Slappy” Floyd Building.